Push the brood nest forward. Add drawn comb or topbars relative to colony activity. 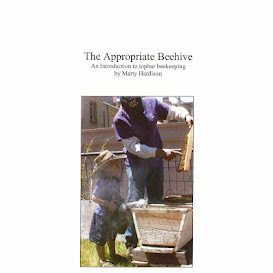 Everything you do in the Spring should enable the bees to maintain momentum... which is "back­wards" in a top bar hive. We had to move every single comb, one at a time, to create space in the back of the TBH. I did not lift every comb out to inspect both sides, like I've done in the past so you'd have pictures. And while I would've loved to see eggs and larvae, or the queen, I really wanted to be done in less than the hour+ I spent the last time I went into the hive. So you and I will just have to be happy with these pictures. I didn't see any open brood at all but, as I said, I was trying to not dilly-dally. Nothing to worry about, though. A colony tries to not allow its queen to lay more eggs than it can feed and keep warm, so they probably interrupted her egg-laying every time we had a snow storm. We had two 10-inchers this month, the last one just 5 days ago. When we were done, the brood nest was moved closer to the entrance (and incoming food) but I'd only succeeded in removing two old combs. The two combs I left in aren't black with use, just a pretty dark brown, and they were brimming with nectar and pollen. The bees worked hard to collect those precious resources, so rather than set the colony back days or weeks, those combs get one more year in the hive. TIP: I like to use spacers at the front of the hive. This enables me to inspect from the front of the hive without disrupting anything else.